When choosing bathroom cabinets, it’s important to select something that both meets the needs of your lifestyle and fits your design preferences. Whether you’re planning a new home or have decided to remodel, purchasing and installing bathroom cabinets is an expensive venture. Bathroom remodels are often more complicated than kitchen remodels because it’s usually a smaller space and there are additional water, electrical, and drainage issues to consider. But don’t worry! At Kitchen and Bath Unlimited we are here to answer all your questions and help you through the process. What is your bathroom routine? How do you use the current space? 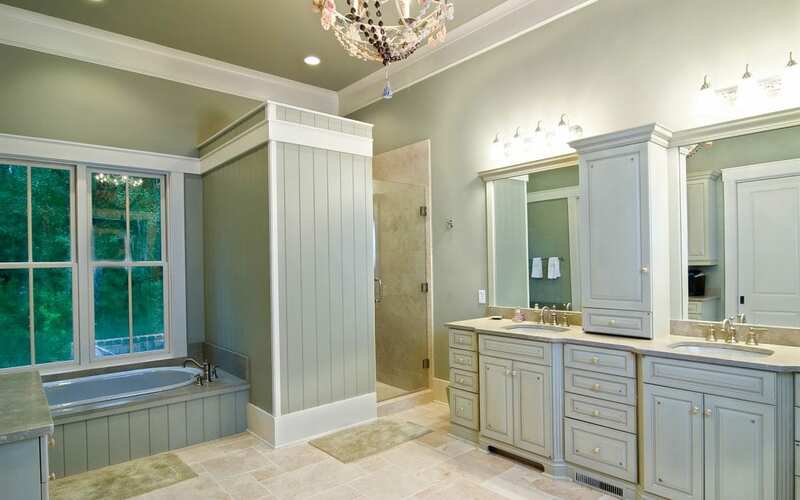 If you’re designing a new home, think about friends and family’s bathrooms you like. What elements do you want to incorporate into your own bathroom? Or, if you’re doing a remodel: What do you like about your bathroom and what has room for improvement? Look at magazines and interior design websites, and bookmark what you like. Is there a theme that emerges? Visiting Kitchen and Bath Unlimited’s showroom is also always an option to consider. You can interact with the bath spaces we’ve designed and see what suits you when choosing bathroom cabinets. Cabinets have a big impact on the overall look of the bathroom. When choosing bathroom cabinets, consider price, style, and trends. Today there are so many choices that it can be overwhelming. Ah, the paradox of choice! But stick to your plan and you’ll pick out something you can enjoy for years. Bathroom and kitchen cabinets: What’s the difference? Bathroom and kitchen cabinets are usually slightly different sizes. Depth – Kitchen cabinets are 24 inches deep, while bathroom cabinets are 21 inches deep. Height – Kitchen cabinets are usually 34 inches high, while bathroom cabinets are typically 31 inches. Today, however, many bathroom cabinets are being made 34 inches too. Bathroom remodels are generally more expensive than kitchen remodels, so make sure you are sticking to your budget. Bathroom vanities and cabinets can cost a few hundred dollars or a few thousand dollars. When choosing bathroom cabinets, think in terms of aesthetics, functionality, durability, and timelessness over trendiness. Bathroom cabinets are in environments that are humid, wet, and frequently used. Carefully consider box construction and materials to make sure yours are durable! In terms of material, wood veneers, laminates, and thermofoil are good choices. If you go with wood, it should be sealed and lacquered. Note that water on lacquer should be wiped off to avoid damage. 1/2-inch particleboard sides; stapled, nailed, or glued drawers; and partial-opening drawer slides. Good for powder room vanities that aren’t used much. Moisture in the bathroom proper eventually weakens the particleboard, which makes it sag. 1/2-inch plywood boxes (sturdier than particleboard). Drawers with dovetailed construction (more durable than drawers that are stapled or glued). 1/2-inch to 3/4-inch plywood or hardwood sides and 5/8-inch hardwood drawers with dovetail or dowel joints. Includes options for full-extension drawer glides and soft-close glides. A matter of preference, you can choose cabinets from three categories: Stock, semi-custom, and custom. Mass-produced. No customization. Bottom line: You save money. Available in 3-inch increments, stock cabinets range from 9 to 60 inches wide and come in 12-inch or 24-inch depths. You can pick up a 30-inch vanity for around $150 to $500. Larger selection of size, door style, stains, and glazes than stock cabinets, but not as many choices as custom cabinets. Widths come in 1-inch intervals. Expect three weeks for delivery. Any size, color, or design you can imagine and your heart desires! Unlimited selection usually comes at a price, though, and waiting time is usually six to eight weeks. That said, custom vanities are not always more expensive and can be a good option if you’re left handed. Take inventory of the items in your current vanity. Note how much of it you’d like to store within arms reach. To maximize storage space, consider hanging vanities that utilize the area around the plumbing. Today’s cabinets usually incorporate organization, such as drawer dividers, cosmetic trays, appliance garages for hair dryers and electronic toothbrushes, and spaces for laying out clothes. A wider vanity provides more storage; a narrower vanity gives you more room to move around in the bathroom. Which do you value more? The vanity won’t interfere with traffic flow. Bathroom and shower doors can swing out without hitting something. Also note that building codes require the distance in front of vanities (and toilets) to be at least 21 inches. There is enough space around the vanity to install a mirror and lights. You’ve considered existing plumbing if remodeling. Connecting to existing plumbing is easy and inexpensive. Moving plumbing around can be expensive. (Plumbers typically charge $45 to $65 per hour.) Even a changing from traditional to wall-mounted vanities requires rerouting pipes and drains. Make sure it’s worth it. Your vanity is on or near a medicine cabinet or shelving (for your convenience). Medicine cabinets start at around $15. Whether you’re going for an old-fashioned or futuristic look, when it comes to choosing bathroom cabinets there are a myriad of options to meet any personal style preference. Trends are fun. It’s exciting to have the latest look, while traditional styles can seem bland comparatively. Trends, however, are trends. While disposable fashion might cost you $20 for a pair of pants, you are only out $20 when it goes out of style. With a bathroom remodel, however, unless you have an unlimited budget and a lot of time on your hands, trendy isn’t your best option. But does that mean keeping yourself contained? Not getting too wild with decorating ideas? Just know when you can be trendy and what to keep classic. A bold shower curtain can transform the room, but it is relatively inexpensive to buy another one. Buying all new cabinets would not be as painless. Paint color is another trend that’s OK to indulge in. It is relatively simple to repaint a wall. This can be a great way to make children’s bathrooms seem fun and whimsical while making it easier down the road to transition the bathroom into a space teens won’t feel too old for. Consider stenciling and primary colors. Later you can choose a more conservative palette as tastes change. Window curtains are another element that’s easy to swap out. Besides, if you get sick of them, you can donate them to charity, making it an eco-friendly way to transform a space. For most of your design decisions, strive for timeless design. White –Timeless, neutral, and clean. You can never go wrong with classic white. Stone – Natural stones such as marble and limestone have been used for centuries. Sinks – A white pedestal sink is classic. Shower walls – White subway tile is classic for shower walls and wainscot paneling. Vintage – If people liked them in the past, and you like them now, chances are you will like them in the future. Antiques bring personality and character to a room. Have fun mixing and matching with the 21st century! When choosing bathroom cabinets, before you decide on a style, also make sure you know what chores come with the territory. Ornate cabinets with beading collect steam you’ll need to wipe down after you take a shower. Base cabinets that rest on the floor rather than on wood feet save you from mopping under them. Make sure custom cabinets are well sealed so they stand up to moisture. Make sure your bathroom fan is in good working order. Typically the tiniest room in the house, a powder room needs a small vanity to go along with it. Since you don’t shower in the powder room, all you need is sufficient room to access the toilet. As a general rule, the size of the room dictates the size of the vanity. Avoid cramming a big vanity into a small room. There are other ways to get storage. Harmonize with the architecture! Choose a vanity that complements the rest of the house or make the room a loud statement. Boldness is an opportunity to have fun and provide a break from neutrals. For the traditional route, a pedestal sink works well, but be aware you’ll lose counter and storage space compared with other sink styles. Kitchen and Bath Unlimited provides expertise in bathroom cabinetry design and installation. For over 30 years our friendly and personalized service, combined with our attention to detail, have made clients’ dream bathrooms a reality! Contact us today at 269-375-2212 to get help choosing bathroom cabinets and let’s get started on your dream bathroom!